Blackpool and the Fylde coast has become a ship graveyard to a number of vessels over the years. Most of the shipwrecks occurred at or near Blackpool, whilst a few happened a little further afield but have strong connections with the Blackpool area. For the purposes of this article, Blackpool means the stretch of coast from Fleetwood to Lytham St Annes. The Travers was wrecked in 1755 with a cargo of lace. In the autumn of 1779 a ship laden with peas was wrecked at Blackpool. In December 1797, the Happy foundered off Lytham St. Annes. She was on a voyage from Oporto, Portugal to Liverpool, Lancashire. The Fanny was wrecked off the coast of Blackpool in 1821, laden with red and black flannel. A ship was wrecked at the Gynn in 1833. The Crusader was wrecked at South Shore in 1839, laden with silk. Some looters from Marton were jailed after being caught stealing the cargo. The Brig Aristocrat was wrecked opposite the Imperial Hydro in 1840. Two of the passengers were drowned. The schooner William Henry was wrecked at South Shore, laden with flour and lard. 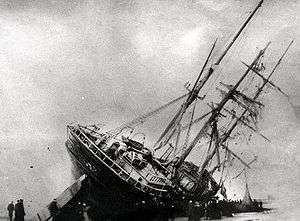 The St. Michael was wrecked at Blackpool on 18 September 1864. The new lifeboat rescued the crew of fourteen. The brig Favourite, of Liverpool was wrecked off Blackpool on 22 November 1865 with the loss of ten crew. She was carrying a cargo of palm oil and seed. The barque Lexington was wrecked, the crew of fourteen were saved by the lifeboat. The Fleetwood schooner Bessie Jones was lost on Salthouse Bank on 26 February 1880. One man was lost, but four were saved. It was this shipwreck that led to a campaign for a lifeboat at St. Annes. The Arethusa was wrecked off Blackpool in 1882, ten people were saved. The Norwegian ship Sirene was sailing from Fleetwood to Florida in the United States on 9 October 1892 when it was caught up in a hurricane and smashed into North pier, destroying part of the pier. The eleven crew members jumped onto the pier to safety. The ship's wheel is housed in Blackpool lifeboat house. The tramp steamer SS Huntcliff had been anchored off Llandudno on 12 February 1894 when the anchor chain snapped. She was beached between Squires Gate and St. Annes, being refloated 11 days later. The beach became a temporary fairground. On 22 December 1894, the Norwegian ship, Abana was sailing from Liverpool to Florida but was caught up in a storm and mistook the then recently built Blackpool Tower for a lighthouse. The Abana was first seen off North Pier but by the time the lifeboat, which had to be towed by horse from Blackpool to Bispham, had been launched it had drifted to Little Bispham where it was wrecked. The ship's bell still hangs in St Andrews Church in Cleveleys. The remains of the Abana are still visible at low tide on the beach at Little Bispham. On the same day as the Abana hit the pier, a fishing boat from Fleetwood, the Petrel was also driven ashore by the same storm close to Uncle Tom's Cabin at North Shore. The HMS Foudroyant, which had been used by Nelson as his flagship from 6 June 1799 until the end of June 1801, was wrecked on 16 June 1897, during a fund-raising voyage around the coast of Great Britain. The Foudroyant came to Blackpool from Southport on 4 June and anchored two miles out to sea between Central and North piers. Just before 6am on 16 June the ship was caught up in a hurricane-force storm and broke anchor. She drifted toward land, and just missed the jetty at North pier before hitting the shore slightly to the north at Cocker Square. The ship was then bought by a local syndicate who made souvenirs from the wood. Most of the ship though was broken up in a storm in November 1897. Formerly a Fleetwood trawler, Commandant Bultinck was wrecked on Rossall Beach on 3 December 1929. Three people were killed. The Thorium was an ICI coaster that ran aground on Knot Spit in 1964. She was refloated six days later. The Holland XXIV was a dredger that ended up beached at Cleveleys in 1981. 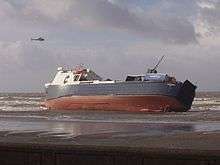 On 31 January 2008, the Riverdance a RORO ferry in service on the Irish Sea, was travelling from Warrenpoint in Northern Ireland to Heysham when it ran into trouble at about 19:30. A total of twenty three people were airlifted from the ferry, which ran aground on the beach at Anchorsholme, Blackpool, opposite Anchorsholme Lane West at about 22:50. The ship was beached very close to the remains of the Abana. On 1 February a 400-metre exclusion zone was placed around the stricken ferry and it was revealed that the ferry could be stranded on the beach for some time before salvage teams could remove her. The ship suffered further structural damage during storms on 12 March, and it was announced on 10 April that all attempts to refloat her had been abandoned and that she was to be scrapped on site. On 27 March 2008 the motor cruiser Coco Leoni ran aground opposite Lytham windmill. The boat was refloated a week later. 1 2 3 4 5 6 7 8 9 "Growth of the County Borough of Blackpool in the County of Lancashire 1500–1938". Stephen Yarwood. Archived from the original on 29 September 2007. Retrieved 25 February 2008. ↑ "Ship News". The Times (4071). London. 20 December 1797. col D, p. 3. ↑ "Favourite". Through Mighty Seas. Retrieved 20 April 2008. 1 2 3 4 5 6 7 8 "Shipwreck Gallery". Blackpool Gazette. 25 February 2008. Retrieved 25 February 2008. ↑ "A Chronology of the growth of the County Borough of Blackpool in the County of Lancashire, from 1500 to 1938". Hall Genealogy. Retrieved 31 January 2008. 1 2 Fleming, Craig (5 February 2008). "A graveyard for ships". Blackpool Gazette. Retrieved 6 February 2008. 1 2 Fleming, Craig (5 February 2008). "The Fylde coast – A graveyard for ships". Blackpool Gazette. Retrieved 6 February 2008. ↑ "Fylde Post Card History: THE ABANA WRECKED 22nd DECEMBER 1894 OFF NORBRECK". rossallbeach.co.uk. Archived from the original on 18 August 2007. Retrieved 6 February 2008. ↑ "Wrecked Rossall Beach". Fylde Postcard History. Archived from the original on 18 August 2007. Retrieved 6 February 2008. ↑ "Cleveleys Beach". Fylde Postcard History. Archived from the original on 16 May 2008. Retrieved 6 February 2008. ↑ "ICI Coasters". Fylde Postcard History. Archived from the original on 18 August 2007. Retrieved 6 February 2008. ↑ "Riverdance ferry drama: Timeline". Blackpool Gazette. 1 February 2008. Retrieved 2 February 2008. ↑ "Ferry runs aground at Blackpool". BBC News. 1 February 2008. Retrieved 2 February 2008. ↑ Marsden, Paul; Joe Robinson (31 January 2008). "Dramatic airlift from stricken ferry". Blackpool Gazette. Retrieved 2 February 2008. ↑ Robinson, Joe (1 February 2008). "Stricken ferry could be stranded "for weeks"". Blackpool Gazette. Retrieved 2 February 2008. ↑ "Final death knell for Riverdance ferry". Blackpool Gazette. Retrieved 15 April 2008. ↑ Bennett, Julia (28 March 2008). "Riverdance ferry has a rival!". Blackpool Gazette. Retrieved 28 March 2008. ↑ Parkinson, Shelagh (8 April 2008). "Sailors refuse to leave stranded yacht". Blackpool Gazette. Retrieved 8 April 2008.